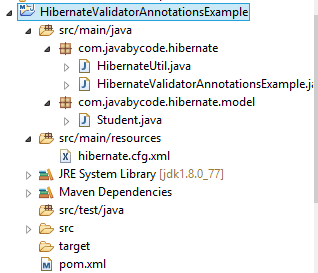 Welcome to Hibernate Validator Annotations Example tutorial. Today, i will show you Hibernate Validator API with a full working example. Hibernate Validator is a JSR 303 implementation for bean validation. The way to work with hibernate framework is to define constraints for java bean fields, and then, validating the bean. Defining validation data using annotation and/or XML. Create customized constraints and validators. We need to add JSR303 and Hibernate Validator dependencies in pom.xml to use them. If you run the application on server application such as JBoss, you can skip over this dependencies because it’s already provided. As you see above, we can also provide custom error message for any validation. If not the hibernate built-in error message will be used. We can create our custom error messages too, all we need is to push ValidationMessages.properties file into the classpath. The property name for message is fully classified annotation name with message at the end, you can easily figure out from above examples. In this Hibernate Validator Annotations Example tutorial, we create a main class in which we save a student object missed some fields. Then we validate that object by using Hibernate validator API.